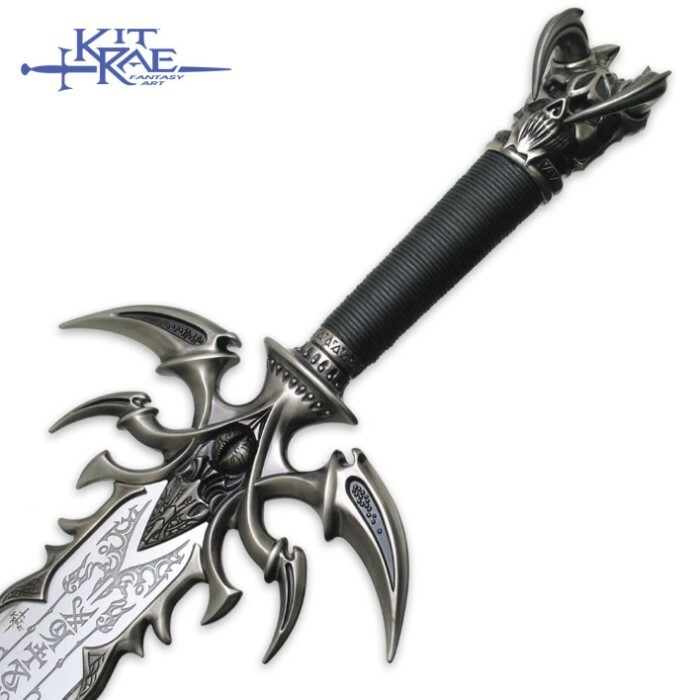 Kit Rae's Vorthelok features a false-edged stainless steel blade, engraved runes, finely detailed cast metal hilt parts with "antiqued iron" metal finish, and a waxed cotton cord wrapped grip. 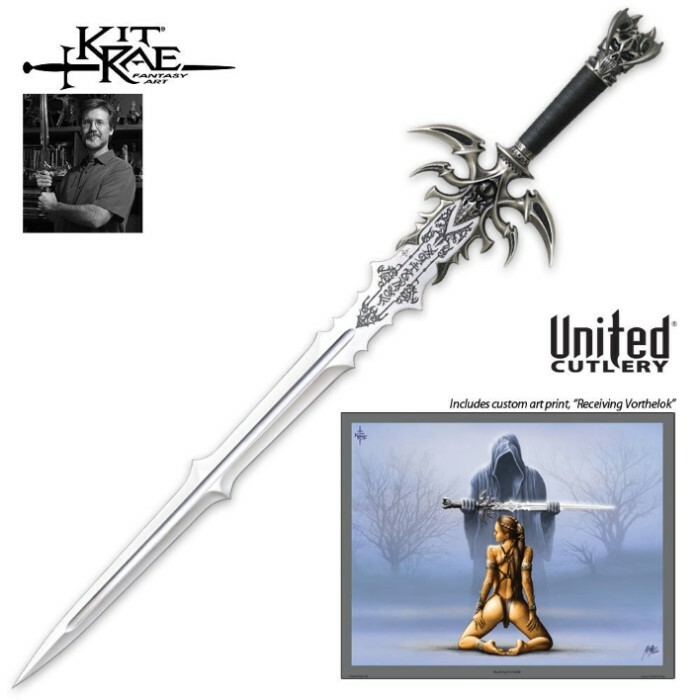 Each sword includes a certificate of authenticity and custom art print hand autographed by Kit Rae. 28 in. blade, 45 in. overall. This is one amazing claymore. When ever someone screws with me I show them this. That spike in th middle and the demon eye is what really gets them. Thank you Kit Rae! I was absolutely amazed by this sword!!! This is, by far, the coolest sword ever! I can not wait to order more Kit Rae swords, and I will too without a doubt be getting more of his swords. I highly recommend this sword to fantasy lovers/ sword collectors. The blade has amazing detail to it. My favorite part is the head at the end of the handle. It looks so sweet. Artwork is nice too. The actual blade seems pretty secure too. I would not recommend swinging this thing of beauty though. Its meant to be for display. The only negative thing I have to say for this blade is that is has some residue on the blade from the plastic it was wrapped in, but I am sure that it will easily come off with polish or whatever. Very glad that I decided to get this swords! This sword is amazing. everything about it exceeds my expectations. Although the plastic that wrapped the sword during shipping left imprints on the oiled blade so it kinda has a snake skin pattern on it. I'm happy to have a sword as beautiful as this.